My kids have never seen an ocean. They've never walked on the sand or felt the waves lap at their feet. They've never heard the ocean roar, though I know they'd love the sound. They like pretending to hear the ocean by holding Grandma's large conch shell to their ears. When you live in the Midwest, a trip to the ocean is a vacation, something that takes planning and time. Someday we'll take the kids to visit an ocean. But for now, they'll have to experience it in books and on film. 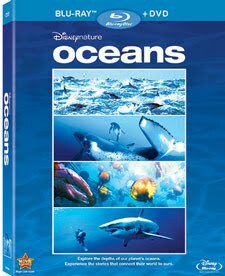 Disney's latest release, Disneynature: Oceans Blu-ray & DVD is a great place to start. Disneynature: Oceans premiered in U.S. theaters on Earth Day 2010. The Blu-ray/DVD combo just came out on October 19th and we had the chance to preview it in our home. Wow, the cinematography in this masterfully produced documentary really is spellbinding. My kids sat entranced for a good portion of the movie, soaking in the fascinating, crystal clear photography and expressive narration by James Brosnan. It really feels like you are right there in that underwater world alongside the extraordinary creatures and sights. The documentary explores all five oceans (the Pacific, Atlantic, Indian, Arctic and Antarctic (or Southern) Ocean). In the beginning of the film children run along the beach and a young boy pauses to contemplate the sight as the narrator remarks, "to really know the ocean, you have to live it." For one hour and 24 minutes, viewers truly live it and gain a special appreciation for the "universe of wonder and mystery" through the amazing sights and sounds caught on film. One of my favorite quotes from Oceans is when the narrator remarks, "Down here it's like nature has given everything a try." Viewers get a chance to witness a variety of different species, all living in their natural habitats -- yellow clouds of jellyfish, mobula rays, a extraordinary blanket octopus, curious sea lions, humpback whales waking up from a slumber, a leafy sea dragon, a strange looking Asian sheepshead wrasse -- the list goes on and on. There's a touching scene with a walrus mother cradling her baby. In one particularly powerful scene, dolphins jump and swim with speed through the water, herding a large school of fish together while sea bird dive down snatching the fish in their beaks. An impressively large whale joins the feast -- what a sight! The narration is there more for effect than for explanation. This is a very visual production, a starting off point for independent exploration. I sat and watched the movie along with my kids and we conversed throughout, discussing the images on screen. As I pointed out the sea lions to my toddler, he looked at me and corrected, "No, those not lions. Those fish." I was, however, impressed at how many animals my kids recognized. I did not allow my kids to witness the heart-breaking sea turtle scene, where baby sea turtles race for their life across a sandy beach while seagulls pluck them up one by one. I didn't think this was something they needed to see just yet. Did you know only 1 in 1000 baby sea turtles make it to the sea? The directors, Jacques Perrin and Jacques Cluzaud bring the viewers closer to blue seas by speaking to their hearts. The film makes you think about the creatures that live there and their future, and it promotes conservation. "The animals themselves cannot stand up for their survival ... Yet, never has the will to protect them been so strong." It is hard to watch it without feeling some responsibility to act. In some way, we are all dependent on the ocean. The Blu-ray's "Living Menus" (main menu) includes a interactive globe that the viewer can spin with a remote and click on various locations around the world that are featured in the documentary to hear commentary and read factual insights. The Blu-ray filmmaker annotation option brings up picture in picture windows during the film as various individuals comment with factual information and insights into production. Learn more about the film at http://disney.go.com/disneynature/oceans/. Educators can find helpful activity guides there. You can also follow Disneynature on Facebook at http://www.facebook.com/Disneynature or on Twitter at http://twitter.com/disneynature. I should buy things like this to watch with my son. He's not really big on videos (he loves Disney cars, but that's just about it! Diego has now been deemed scary for no known reason). But he loves animals and the aquarium. I watched this over the weekend and it was excellent! Greatest Show on Earth. "Intelligent Picture" is being taught in our schools; educators are being asked to "teach the controversy" behind evolutionary theory. There is no controversy. Through rich layers of scientific evidence -- from living examples of natural selection to clues in the fossil record; from natural clocks that mark the vast epochs wherein evolution ran its course to the intricacies of developing action adventure.